This is the home you've always wanted to live in - here is your chance! 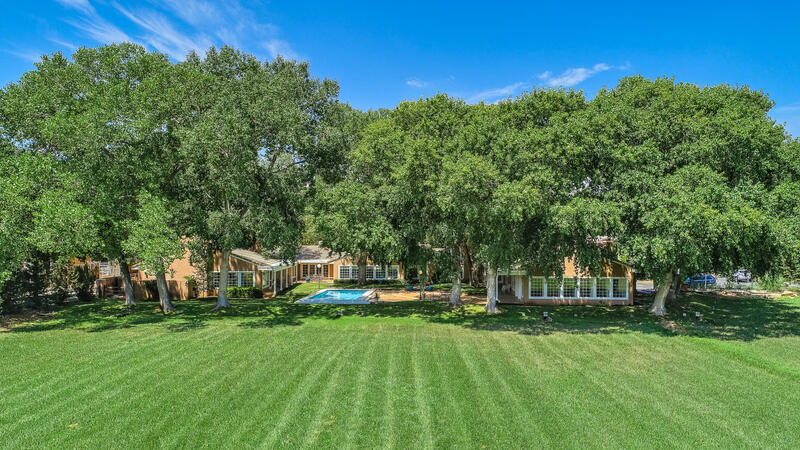 Iconic North Valley estate on 6.83 acres in Los Ranchos! This magnificent horse property sits in the heart of the Village with lush, mature landscaping, barn/RV garage, stalls, workshop & pipe fenced pastures. The home features a grand scale 60x32 Great Room with cathedral beamed ceiling, wood-burning FP & a multitude of windows looking to the gorgeous grounds & the Sandia Mtns. Spacious kitchen with oversized island & indoor grill. Formal dining and living areas MBR boasts a view of the sparkling pool, gas log FP, plantation shutters, his/her vanities, separate handicap-accessible shower, walk-in closet with separate cedar closet! ...more. Courtesy of Kate Southard Real Estate.